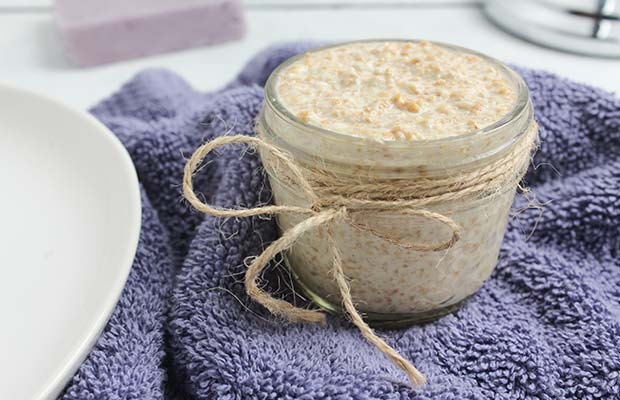 Create this home-spa recipe and feel the benefits as dried skin is sloughed away, leaving your body feeling smooth and silky. In a blender or food processor, finely grind oats. In a bowl, combine yogurt, oats and wheat bran. In another bowl, mix together flaxseed oil, honey and essential oil. Add honey mixture to yogurt and thoroughly combine. Wet body in a warm shower and apply to torso, arms and legs. Massage gently into skin with a circular motion. Rinse well and pat skin dry. Yield: 1 cup (250 mL).